Rachel Khoo's fifth cook book, The Little Swedish Kitchen, is a vibrant culinary tale of Swedish classics along with lesser known dishes. Championing the seasons and bountiful local produce, this book will have you instantly heading for the kitchen. After working with world renowned chef Magnus Nilsson, Khoo moved to Sweden with her husband and keenly celebrates her adopted home in this new book. Home for the last several years has been Stockholm (most of the time). Although I’m in London at least once a month and spend quite a bit in the South of Sweden at our house in the countryside. The last four cookbooks I’ve written have always been a way of documenting a personal journey. 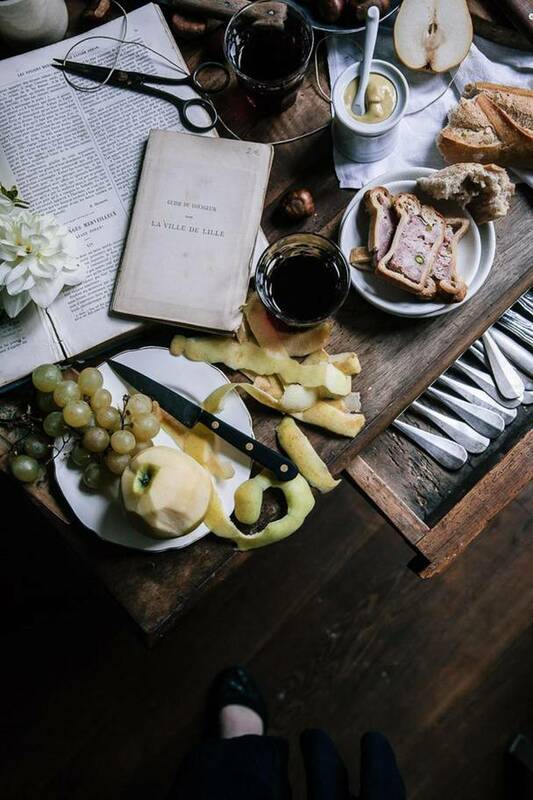 The Little Paris Kitchen was about my experience of living and cooking in Paris, My little French Kitchen about my travels around France and Rachel Khoo’s Kitchen Notebook was a peek into my personal cooking diary with influences from around the world. It felt only natural to write a cookbook about Swedish food and how I discovered the culture, people and language when I moved here several years ago. I’ve always felt the easiest way to get to know new culture is through its food even if you don’t speak the language. Food will do it for you. It’s an universal language. Even though the underlining theme of the cookbook is Swedish food it is not a book with over 100 different ways to make meatballs. I divided the chapter into the four seasons and each season has a range of recipes from simple suppers, dishes to wow friends and family or sweet treats. What I discovered while researching the cookbook that Swedish food has its roots in simplicity. It doesn’t require a cupboard full of exotic spices. Most of the ingredients you probably already have in your fridge or can easily get at your local supermarket. The geographical location of Sweden and, therefore, short growing season meant that the range of produce is not as abundant like say France, Italy or Spain. This influenced the cooking culture and forced cooks to be creative with a handful of ingredients. It’s a very modern way of cooking. In essence this cookbook is for any home cook who would like some seasonal inspiration for the ingredients they probably already have in their cupboard. What's your favourite recipe from the book? 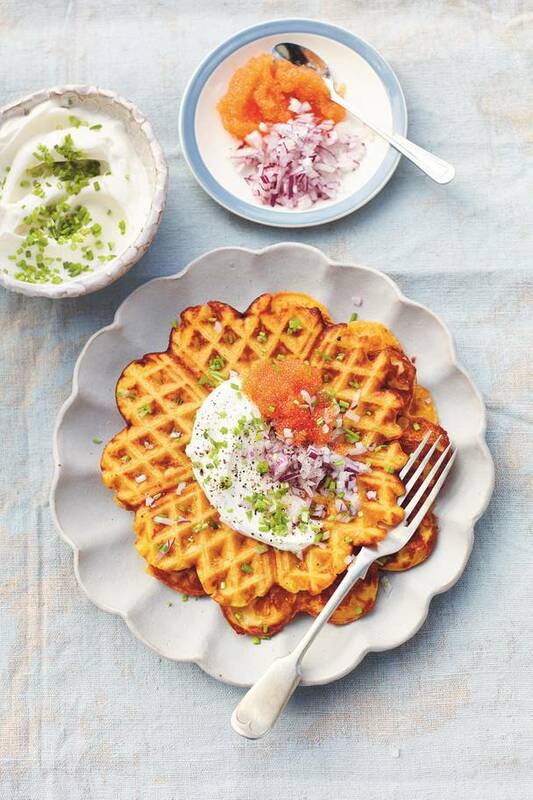 It’s impossible to pick one but one of my favourites is the Roasted Butternut Squash Waffles (scroll down to find the recipe). I love a waffle but adding the sweet nutty flavour of the butternut squash makes the waffles so much more flavoursome. Plus the bonus with this batter is you can have them either sweet (with a cloud like dollop of whipped cream and fresh berries) or savoury (the Swedish way would be with crème fraiche, finely chopped red onion and chives with some fish roe but you could also do grilled bacon and chopped tomato salad). Perfect for breakfast, brunch, a light lunch or dinner. And if you don’t have a waffle machine you could simply cook them like American style pancakes. And your favourite no-fuss dinner recipe? Stewed spinach eggs – think Swedish Shashuka. Instead of a spicy tomato sauce the eggs sit in a creamy spinach which is topped off with pink pickled onions (always have a jar in my fridge – such an easy way to liven up any dish from stews to salads), dill and some thinly sliced chilli. Now your ultimate dinner party dish? Chilled cucumber soup with beetroot yoghurt granita. One of the easiest mistakes to make when planning a dinner party is to serve too much heavy food. You want your guests to feel comfortable rather than bloated and rolling home. With all the hot weather this vibrant green cucumber soup is the perfect way to start a meal. It’ll refresh the guests and ready them for the other courses to come. The beetroot granita is a simple way to make the dish eye popping with it’s bright pink colour. I have served small espresso cup versions of this after a main course as a palate cleanser before the cheese or dessert course. It goes down a treat anytime of the year. Finally, your favourite dessert from the book? Cardamom bun bombe (scroll down to find the recipe). It's a great way of using up day-old cardamom (or cinnamon buns) and a tub of vanilla ice cream. All you make is a slightly salty caramel sauce spiked with cardamom which you swirl into the ice cream (and keep some to pour over the dessert for serving). It’s effortless but looks impressive. Plus you can make it well ahead of time (even a month) and have it in the freezer for whenever you might need an emergency dessert. Which chefs have influenced you and your approach to food? Anthony Bourdain influenced me hugely with his approach to making food/travel TV and also his writing. He was able to touch on such a wide range of subjects through sitting down and having a meal. His evocative and descriptive use of words and constant striving to capture the place through cinematography nods to cult film directors. I really miss spicy food living in Stockholm. I’d happily get my fix at Hoppers. I grew up with eating Dim Sum in China town on Sundays with the old ladies pushing the trollies full of steaming baskets. Now I’m not so fussed about the trollies but the dim sum have to be good. I love BaoziInn. My dad is from Malaysia so I grew up eating Laksa even having it for breakfast. The spicy broth from Shambal Shiok is the best hangover cure I know. What cookery books do you always reach for from the shelf? I have such a hotch potch of a collection. When I’m testing recipes I like to reach for books that are quite technical like The Food Laband McGee on Food and Cooking. I have a very well thumbed copy of The Flavour Thesaurus. It’s great to get ideas going when you need a little push with thinking differently with flavour combos. Mash the roasted butternut squash or pumpkin and mix with the butter, buttermilk, whole milk and eggs. Sift together the remaining waffle ingredients into the bowl and fold to incorporate. Don’t over mix or you’ll get a heavy batter. Leave to rest at room temperature for 20 minutes. Heat up your waffle iron, brushing with melted butter if required (no need with non-stick ones). Pour a ladle of batter into the middle. Gently close the lid and cook for a couple of minutes or until the outside is crisp (this will vary, depending on the heat of your waffle iron). Leave to cool for a minute before topping with the garnish of your liking. Top tip / If you don’t have a wa½e iron, you could make small drop pancakes instead. Heat up a non-stick frying pan on a medium heat, then pour in a small ladleful of batter. Fry for a couple of minutes on each side until golden. Get ahead / The batter can be made the day before and chilled. Take out of the fridge 30 minutes before using, so it returns to room temperature. This ensures a lighter, fluffier batter. If you happen to have day-old, slightly stale buns lying around, this is a good way of using them up. I’ve also made this dessert using bought buns when I’ve been short of time and need a quick and easy dessert for a dinner party. Start by making a caramel. Pour the syrup into a large, heavy-based pan, followed by the sugar, cardamom and salt. Place on a hot heat. Swirl the pot around every minute or so to help incorporate the sugar. Once the caramel starts to simmer, cook for a further 5 minutes or until a dark golden brown. Take off the heat. Gradually incorporate the cream – be careful, as the mixture will splutter and rise. Fill a bowl with water and ice, place the caramel pot on top of the ice and leave to cool. Take the ice cream out of the freezer and put into the fridge to soften slightly. Line your medium-sized bowl with cling film, leaving some excess to fold over the top to cover. Cut the cardamom buns in half and place some of them cut side down in the bowl, so the bowl sides are fully covered. Beat the softened ice cream and swirl in a third of the cooled caramel. Set aside the rest for serving. Spoon the ice cream into the bowl and press it down. Cover the ice cream with the remainder of the bun halves. Wrap with the excess cling film and freeze for at least 4 hours. To serve, take the bombe out of the freezer 15 minutes before serving. Open up the cling film at the top, place a serving plate over the bowl and turn upside down. Remove the cling film and leave to thaw slightly. Right before serving, pour over the remainder of the caramel sauce. Use a knife run under hot water to cut the bombe. Cardamom can be replaced with other spices, such as cinnamon, ground ginger and allspice. The Little Swedish Kitchen by Rachel Khoo (Michael Joseph, £20), buy it here. 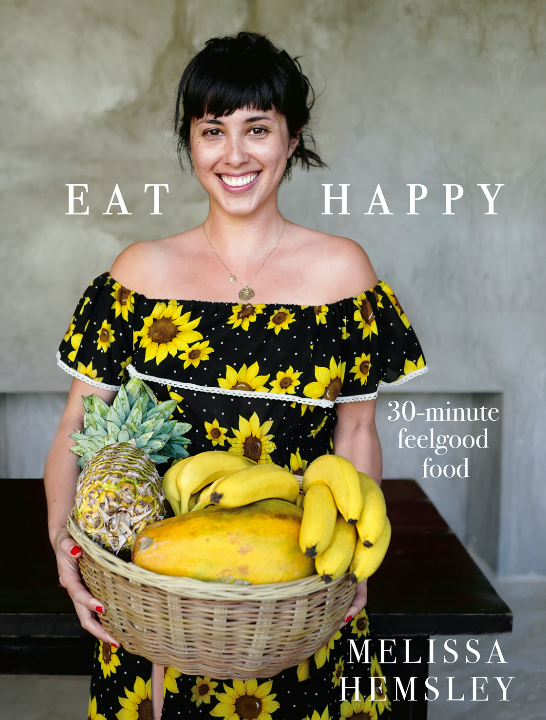 Ella Mills' latest cookery book not only offers up a beautiful recipes for her legions of dedicated fans but also shares insights on the life and business lessons she has learnt building Deliciously Ella. 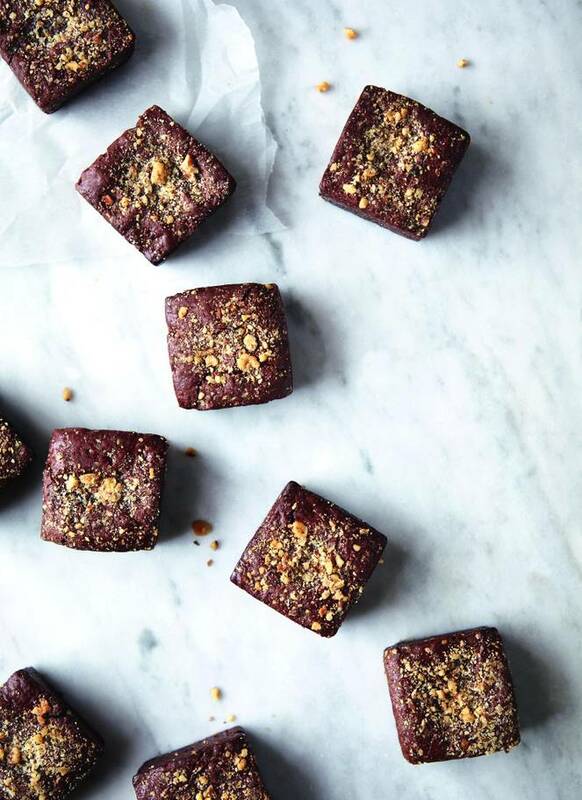 Throughout the 100 vegan recipes she shares are regular diary style inserts that open the lid on how she has grown her empire thus far and delves into what’s next for the ever-growing brand. On the recipe front, this book is for both those who want a complete lifestyle overhaul and for those that are looking for quick, simple, plant based meal inspiration of which there’s plenty to pick from. Where’s home for you or where do you spend the most of your time? We live in Notting Hill and spend most of our time there, in our deli just off Oxford St and in our office which is in Soho. It’s a celebration of everything I think plant-based cooking should be: vibrant, warm, colourful, abundant. It’s about sharing recipes and ideas rather than anything prescriptive and all the recipes have been chosen by our readers. They all come from our delis, supper clubs and pop ups and we choose the hundred most popular for the book from the five bean chilli with corn bread to peanut cookies, thai curries, miso aubergine and broccoli salad, vegan shakshuka, banana apple muffins and all our cakes! I’ve also shared a diary of how we’ve built Deliciously Ella and all the stories, ups, downs, successes and mistakes that have happened behind the scenes. Anyone who wants to make eating their five-a-day a little more interesting and is looking to include a few more veggies in their diet. It’s all about taking simple ingredients such as lentils and cooking them into something delicious, like adding them to sautéed onions, garlic and carrots with paprika, mustard seeds and curry powder and letting them simmer with coconut milk, dried apricots and roasted cauliflower to make a thick, creamy dahl. Favourite recipe from the book and why? So hard to choose just one… I’m obsessed with the Sri Lankan curry which has roasted sweet potatoes and butternut squash cooked with roasted red peppers and mixed into a base of red onion, green chiLli, garlic, spice and coconut milk. I love the creamy artichoke and edamame dip too, which I serve with our black rice, piquillio pepper and pistachio salad. For sweets, the fudgy brownies are a staple in my life, as are the mango flapjacks and the banana bread. 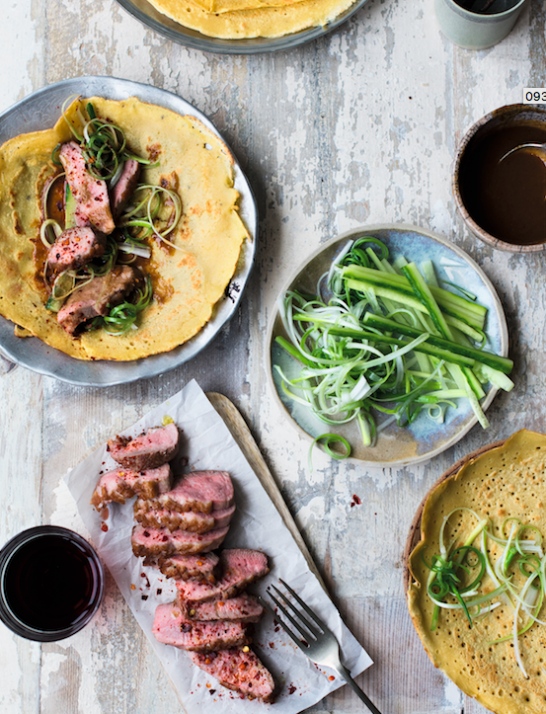 Your favourite quick mid week, no fuss dinner, which recipe should we head to? The five bean chilli (scroll to the bottom for the recipe). It’s so simple, uses kitchen cupboard ingredients and is perfect for big batch cooking. We sauté garlic, celery and onion before adding fresh chilli, rosemary, thyme and tomato puree, then simmer the beans with a splash of ample, tinned tomatoes and black pepper until they form a lovely thick consistency. I love them with our black bean, coriander and chilli corn bread when I want to do something for friends, and when I’m on my own I serve them with brown rice, a squeeze of lime and a dollop of coconut yoghurt. Your ultimate dinner party dish (from the book), failsafe and impressive? Our sweet corn chowder with chilli and coriander to start, it so sweet and creamy – I could eat vats of it! Then our mushroom and cauliflower risotto with rosemary and parsley and our warm chocolate fudge torte with chocolate sauce to finish. We’ve made this dish for lots of events and no one knows it’s plant-based, it’s got so much flavour and is always a real hit. Your favourite dessert from the book and why? Either the peanut cookies when I want something simple, they’ve got just six ingredients and take 15 mins to make, or our orange and blueberry cake with a homemade orange jam in the middle and a cashew based icing when I want something fancier. Which chefs have influenced you and your approach to food the most? There are so many brilliant chefs making plant based cooking so much more exciting, which is exactly what we need if we’re ever going to make broccoli something everyone looks forward to! I think Anna Jones is amazing, and Ottolenghi of course. Top three favourite restaurants to eat out at? I love our deli for bright colourful salads at lunchtime, The Barbary or Palomar for date night and Amaya for something special. What cookery books do you always reach for from the shelf, do you collect cookery books? We’re launching our new Plant-based Cookbook this week (The Cookbook) and our new podcast too, which is really exciting. We’re got a big branding project launching in a couple of weeks, so all our packaging on our energy balls, oat bars and granola/muesli will be changing and then we’re launching a line of natural, plant-based frozen meals at the end of the month, so lots going on! I think this has been one of our most requested recipes. I can’t begin to count the number of emails I’ve had asking for it, so I’m really excited to finally share it with you. Both the chilli and the corn bread are surprisingly easy to make and they taste so incredibly good! The chilli is really hearty and I love the texture combination of the beans in the chilli and the crispy crust of the golden corn bread. If you’re going to make one recipe in this book then make this! The chilli serves four and the corn break makes enough for 10. Start by making the corn bread. Preheat the oven to 200.C (fan 180.C). Line a deep 35 x 25cm baking tin with baking parchment. Place three quarters of the sweetcorn in a food processor and pulse until smooth. Once smooth, mix together with the rest of the whole sweetcorn kernels. Place all the dry ingredients in a large mixing bowl and stir well. Once mixed, add the almond milk, oil and apple cider vinegar and give everything another really good stir until well combined. Next, add the coriander, black beans, chilli, salt, pepper and sweetcorn, giving it all one final mix. Once the mixture has come together, pour into the lined baking tin and bake in the oven for 50–55 minutes until golden and cooked through. To test if it is cooked, insert a knife into the corn bread, it should come out clean. If not, place back in the oven for 5 more minutes to cook through. While the corn bread is baking, prepare the chilli. Place a large saucepan over a medium heat and add a drizzle of olive oil, the onion, celery, garlic and a pinch of salt and cook until soft, about 5–10 minutes. Now add the chilli, rosemary, thyme and tomato pur.e and cook for another 5 minutes. Add the beans, tomatoes, 150ml water, maple syrup and some pepper and bring to the boil, then lower the heat and leave to simmer for 25–30 minutes, at which point it should have a thick consistency. When you are ready to serve sprinkle the chillies and spring onion over the top and enjoy with the corn bread. The corn bread is best eaten fresh, especially when it’s warm out the oven, but the chilli tastes even better the next day, so keep any extras in the fridge to take to work as a packed lunch or pop it in the freezer if you want it to last longer. If you do have leftovers of the corn bread, however, you can store it in an airtight container and enjoy it the next day. For the mixed beans, we buy tins made up of red kidney beans, black-eyed beans, borlotti beans, lima beans and pea navy beans,but there are different kinds available so just use what you like. I’ve been so excited to share this recipe with you, it’s our all-time favourite and probably the most popular sweet recipe we’ve ever had at the deli! The brownies are so gooey and fudgy and I love the crunchy bites of walnuts on top. I often make these for friends, serving them hot out the oven with a scoop of coconut ice cream on top. Preheat the oven to 190.C (fan 170.C). Line a 25 x 18 x 4cm baking tin with baking parchment. Place the chia seeds in a bowl with 4 tablespoons water, mix well then leave to one side for 10 minutes to thicken up. Place the flour, bicarb, salt, cacao powder and coconut sugar into a large bowl and mix well to remove any lumps. Next, add the almond milk, chia mixture and melted coconut oil and mix well for 5–6 minutes to ensure everything is well combined. Pour the mixture into the lined tin and sprinkle with the walnuts. Bake for 25–30 minutes, until cooked through but still a little fudgy in the middle. Leave to cool in the tin for 10 minutes, then transfer to a wire rack, before cutting into brownies. In the deli we bake these brownies in individual moulds, which gives them a crusty edge, but here we’ve suggested baking them in one large tray as it’s easier and makes them extra gooey. 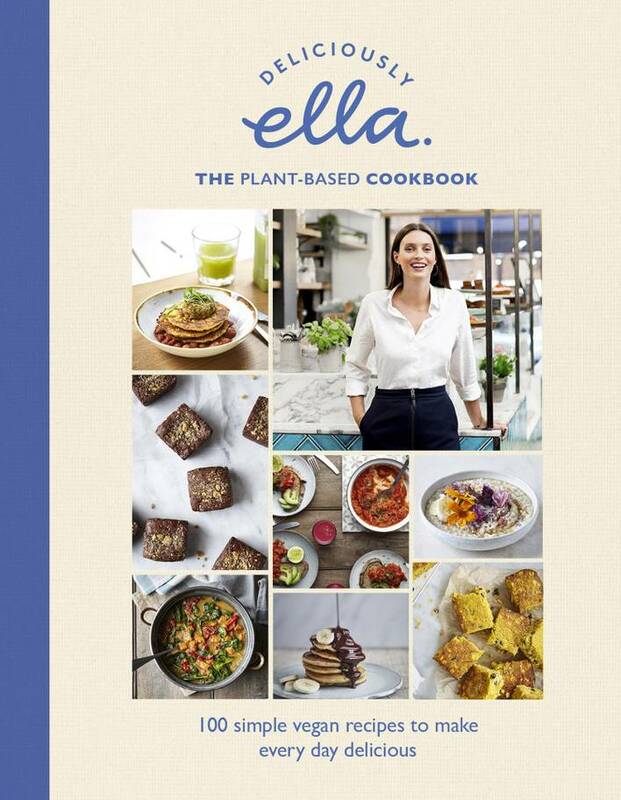 Deliciously Ella The Plant-Based Cookbook by Ella Mills (Hodder&Stoughton; £25), buy it here. Bread is Gold is the culmination of recipes donated by over 45 of the world’s top chefs who have spent time cooking at Refettorio Ambrosiano, the Milan based community kitchen set up by Boturra. Using every day humble, imperfect and often out of date ingredients, the chefs create simplistic yet incredible dishes and ones those that are easy to replicate at home. There’s a focus on food waste, creativity and as you’d expect from Bottura; a passion for good food. All of the royalty proceeds from Bread is Gold go to Food For Soul community kitchens, which are being set up across the world over with the aim to fight food waste and feed those less privileged. This book is an essential for your cookery book collection. I live in Modena, my hometown. I couldn’t live anywhere else in the world. That is where Osteria Francescana is located. I am so lucky to have such incredible ingredients around me to work with, from Parmigiano Reggiano to Balsamic Vinegar. I also travel a lot, and although I love the kitchens from around the world, I will always be true to my Italian roots. It was October 2015, and we were celebrating 6 months of success of Refettorio Ambrosiano, the community kitchen we set up in Milan as our own interpretation of the theme launched by Expo: Feed the Planet –Energy for life. Chefs from all over the world came and joined us to transform food surplus from the pavilIons into tasty and nutritious meals, served to our guests from vulnerable conditions. We had no idea of what we were doing or the impact of such a project on the overall community. It was amazing: people who were complaining for the opening of a community kitchen were now volunteering day and night. Chefs were so enthusiast that they wanted to come back as well as set a new community kitchen in their towns. From the first weeks where guests were sitting in silence and ate as quick as they could, we couldn’t let them leave. They were celebrating every single night. The Caritas Ambrosiana decided to keep the Refettorio open and alive, whereas Lara and me decided to found Food for Soul to replicate the same model around the world and reach as many communities as possible. But then we thought: how can we reach the wider public? How can we involve the people at home in the fight against food waste? And the answer was just in front of us: not only the chefs came all the way from their restaurants to Milan, but they also found the time to write down the recipes they had made for our guests. Bread is Gold collects all these recipes, as well as the stories of Refettorio Ambrosiano. 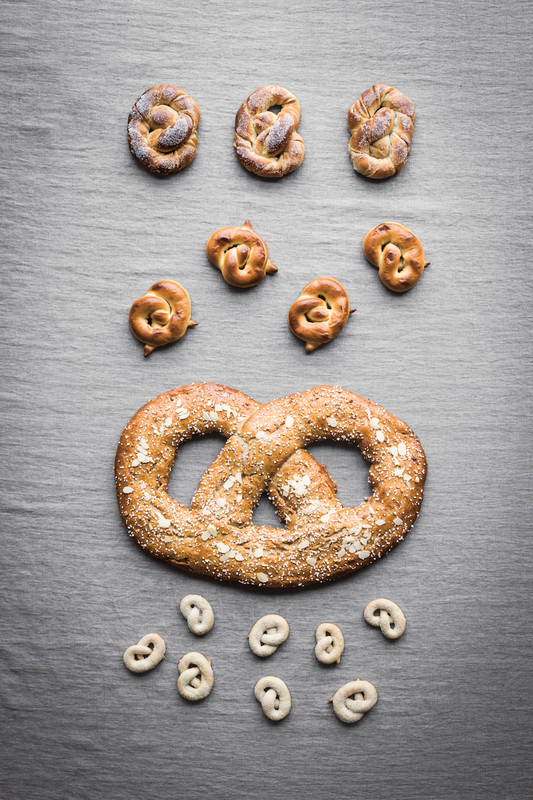 But more than a cookbook, Bread is Gold is a book for ideas. You won’t learn how to make pesto, but how to make pesto with what you have left in your fridge. The fight against food waste starts from your home. Everyone should, because everyone can be part of the solution. I love them all… but maybe the Banana peel chutney by Gastromotiva is my favourite because it is is totally unexpected. By making resourceful even something that we usually throw away, you’re making visible the invisible. I also like the two variations of the original pesto alla genovese: instead of pine nuts, I used breadcrumbs and René Rezdepi used popcorn. Both results are lighter than the original recipe and give more attention to the herbs. In a saucepan, heat the mustard seeds over medium heat until they start to pop. Add the butter, oil, and onions and sauté until golden. Add the ginger, chilies, and spices and cook until fragrant, about 15 seconds. Add the banana peels, salt, brown sugar, and orange juice and let cook for 15 minutes, or until a thick chutney consistency is obtained. Add the grapes and cook for 5 minutes more. Remove from the heat and add more orange juice or filtered water if necessary to obtain a jammy consistency. Season to taste with salt and sweeten with sugar if necessary. Add the lime juice and stir. Transfer to a sterilized jar and store in the fridge for up to 1 week. Which recipe should we head to for your favourite quick mid week, no fuss dinner? There are recipes for meatballs that are easy and delicious, as well as gazpachos and soups for every season, like the gazpacho with strawberries made by Daniel Humm at early summer; the one with watermelon by Matias Perdomo in late summer; and the one by Mark Moriarty with roasted vegetables. They don’t need any professional expertise nor luxury products: all these extraordinary meals are mad from ordinary ingredients. Exactly the same you can find at home, in your pantry or fridge. 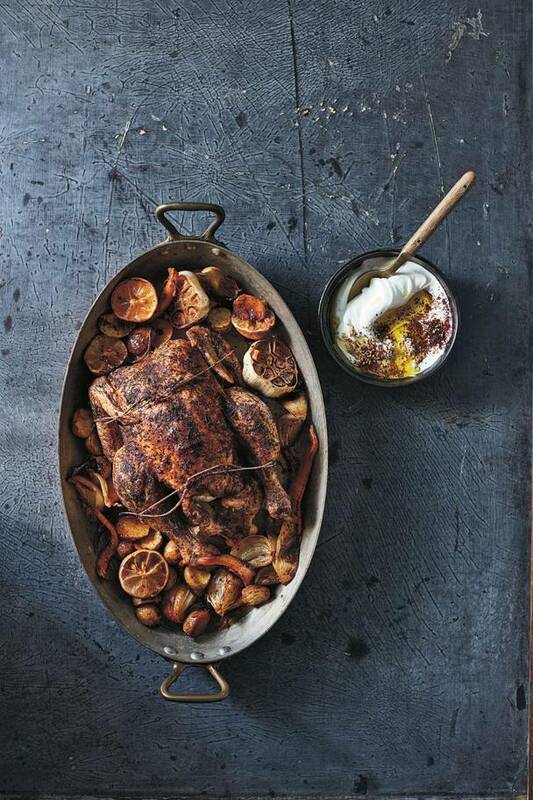 Your ultimate dinner party dish from the book, failsafe and impressive? I would start with a mole dell’orto that Enrique Olvera made for our first charity dinner at Refettorio Ambrosiano. The intense flavour and the vibrant colour are a good way to say welcome to your guest. As main course, I would serve the rich, heartwarming baked pasta alla parmigiana by Viviana Varese, makes you feel like home. And to end up with a smile –and I literally mean it, the banana smile by Michel Troisgros. The simplest yet the most impressive dishes. Ricotta ice cream with tropical fruit sauce and balsamic vinegar by Daniel Patterson. I love ice cream. Everyone used to love it at Refettorio Ambrosiano. We kept our ice cream machine running day and night, because it was the easiest way to recover fruit and milk. Then some chef, like Daniel, found out how to make ice cream even with cheese, vegetables and other unexpected ingredients. Daniel enriched this very delicate ricotta ice cream with a sweet twist of tropical fruit, balanced with the acidity of my favourite ingredient: balsamic vinegar. I have been very lucky to have several culinary mentors. Some are more famous than others. My first mentor was George Cogny, a French chef living in Piacenza. He taught me how to apply classic French technique to the ingredients from our local terroir in Emilia-Romagna. Then came Lidia Cristoni, a true Rezdora, who taught me everything about traditional cooking and how to run a clean and efficient kitchen. Then came my encounter with the one and only Alain Ducasse who taught me the value of using locally sourced ingredients and establishing trusting relationships with artisans, farmers, fishmongers and so forth. These lessons at Louis VX were very valuable to me and helped guide my decision to open Osteria Francescana. My last mentor was Ferran Adrià. During the summer of 2000 I was able to cook with his incredible team at El Buli. He pushed me over the edge and taught me not to be afraid of my ideas. He let the cat out of the bag you could say. The art of eating well by Pellegrino Artusi, which is the cornerstone of the Italian Cuisine. When Garibaldi unified Italy through battles, Artusi made it with a cooking book, by stating its uniqueness through the wide diversity of regional cuisines. Artusi is also an example of cucina povera, the philosophy of recovering every single breadcrumb, leaf, and peel; every animal from nose to tail. Moreover, it is a book addressed to domestic kitchen, hence a book for everyone. In this way, I hope that Bread is Gold will be the new Artusi. After Milan, Rio de Janeiro and London, the next Refettorio will open in Paris in early spring. We’ve also been very lucky to receive a grant from the Rockefeller Foundation that will help us grow sustainably and expand our model even in the US. And then there are many other plans for Montréal, Thessaloniki, Rome, Naples, Turin, Burkina Faso, and who knows where else. As I always say, in my future I see more future. Bread is Gold: Extraordinary Meals with Ordinary Ingredients by Massimo Bottura & friends is published by Phaidon, buy your copy here. The Cottage Kitchen is an entirely charming cookery book that's guaranteed to have you ready to pack up and move to the countryside to live the quintessential, English dream. Rolling hills, log fires and quaint little villages with thatched cottages - and a dog to boot. This is a book packed full of heart-warming recipes and tales that are as beautiful to read as they are to look at. The Cottage Kitchen is a cookery book to be treasured, swooned over and - more importantly - cooked from. Here, Anna Barnett chats to author Marte Marie Forsberg about her go-to cake recipe, her favourite restaurants and moving to the countryside. My mother always says that home for her, is where her loved ones are, and I must admit that over the years that has come to feel true for me too. Meeting my soon-to-be-husband, and with the much anticipated arrival of our baby girl in just a few weeks, home is where we can be together. It´s more about the people than the place. However, we have fallen head over heels in love with a small village called Tisbury, in Wiltshire and bought a cottage and made it our home. Its green rolling hills, truffle laden forests, old estates and beautiful lakes, makes its hard not to find this place attractive. But it is the glorious wee village with its wanly old cottages, fish monger, butcher, deli with my favourite cheeses and charcuterie from France and Italy in addition to local treasures, and with a bottle shop offering up treats from the continent both my the glass and bottle create a quality of life we truly love. Ever since I was a little girl I’ve devoured books with gusto. Reading is a form of escape, a way to be inspired, and a way to dream, and I’ve always hoped that one day I´d find a way to put pen to paper and write my own book. When I got approached by Clarkson Potter in New York to see if I was interested in writing a cookbook, I knew the time was right, and that I wanted the book to be as much about the personal story as it was about the recipes and imagery. The biggest inspiration behind the book, though, was probably the move to the English countryside. It felt like a reawakening of both my senses and tastebuds, in addition to being a return to my roots of growing up in the countryside in Norway. It changed my fast paced, big city life that I´d grown accustom to in my twenties living between Tokyo, Milano and San Francisco, and gave me an opportunity to rediscover who I was, or perhaps who I´d become. I wanted the book to feel personal, and to invite the reader in to my cottage kitchen. If you love simple rustic comfort food mixed with stories behind each recipe and a good dose of the English countryside, then this cookbook is for you. Looking for a quick mid-week, no fuss dinner, which recipe should we head to? When in doubt I usually go for my risotto Milanese, a traditional creamy Saffron risotto with bone marrow, that is ever so tasty and traditional to my second home town, Milano. It's fairly easy and straightforward to make, and any leftovers can be made into these tasty deep fried arancini balls for lunch the next day. You’ll find both recipes in my book. What's your favourite recipe from the book and why? It's hard to choose as I love them all, but I think my ultimate favourite recipe is Marie´s birthday cake with wine-soaked strawberries and fresh raspberries. It's just such a treat and relatively easy to make. It does take a bit of time, but the result is mouthwateringly fresh and delicious. It´s quite the show stopper. Tell us your ultimate dinner party dish? When hosting a dinner party I love being able to enjoy pre-dinner drinks with my guests rather than running around in the kitchen, so my orange and clove roast chicken with pears and baked butternut squash (scroll down for the recipe), is full of flavour and taste, and can be left to work its magic in the oven while I serve my guests a cold welcome drink. And what's your ultimate dessert? When in doubt I reach for my birthday cake for dessert. As mentioned above it is a real favourite and it's always a highlight of any meal with its wine soaked strawberries and fresh raspberries nestled in between layers of sponge, cream and vanilla custard. It goes without saying that when the berries are in season it elevates the cake, but I make this year-round when I want a gathering to be extra special. It's also great as an afternoon tea treat on the weekend. Can you name your top three restaurants? Spring in London is always a treat to dine at, and I love their scraps menu, using up whatever is leftover and creating an exciting one off meal. Not only working towards cutting food waste it also makes leftovers feel like a real treat. Al Matarel and Da Giacomo in Milano, both lovely old school trattorias. The first, Al Matarel, scribble on their windows with a marker when the Alba truffles have arrived, and it all just feels like you're taking part in a no-fuss "Nonna" meal that tastes better than any Michelin star restaurant you've ever been to. Pythouse Kitchen Garden a local favourite in my neck of the woods of Tisbury in Wiltshire. Seasonal, with mostly local produce and from their own garden, rustic meals cooked over open fire and smoked create simple and delicious meals that I return to again and again. Plus they have a Guinness and chocolate cake to die for! Which cookery books do you always reach for from the shelf? I reach for Anna del Conte's books on a weekly basis, Nigel Slater's many books and Buvette. The latter is Jody Williams' cookbook with favourite recipes from her two infamous gastrotheques in Paris and New York. This year I´m simply going to chase my dreams, as the saying goes, if you don´t build your own dreams, some else will hire you to build theirs. This year I´m also launching quite a few more photography and business workshops around in our favourite spots in Europe, which always makes me ever so excited. I´m also renovating my wee countryside cottage. It feels ever so exciting to be able to properly put my own stamp on a place, to set the backdrop for guest to come spend a weekend and create memories to take home with them, hopefully of an excellent time! I'd love to write a second and third book in the cottage kitchen cookbook series, telling the tales of good rustic home-cooked food harvested in season, grown in your back yard, and served with love with friends and family. No matter how wonderfully exciting a new eatery can be, my favourite restaurant will always be a meal shared with friends and family at home. Preheat the oven to 200°C / 400°F. Butter a large roasting pan with 3 centimetre / 1 1/2 inch high sides. Remove chicken from fridge 30 minutes in advance. Pat the chicken dry with paper towel. Place the chicken into the prepared roasting pan, backside up. Using a pestle and mortar, firmly pound the butter, pepper, and chilli until well combined. Use your hand to carefully loosen the skin away from the chicken breast. Gently stuff half of the butter mixture underneath the skin on the back of the chicken. Rub the remaining butter over the top of the chicken, and then season generously with salt and pepper. Press the whole cloves into the top of the chicken, piercing the skin with the clove tip. Squeeze two orange wedges over the top of the chicken. Place two orange wedges inside the chicken carcass with half of each of the thyme, the sage, and garlic cloves. Arrange the butternut squash, onion quarters, potatoes, pears, and remaining orange wedges around the chicken, and scatter the remaining thyme, sage, and garlic amongst the vegetables. Liberally drizzle with olive oil. Cover with aluminium foil. Place the pan on the middle shelf of the oven roast 40 to 45 minutes. Remove the pan from the oven, uncover, and stir well, twice. Baste the chicken with the juices that have gathered among the vegetables. Reduce the oven temperature to 180°C / 355°F and roast, uncovered, until the chicken is cooked through and is crispy brown, stirring through two more times, 40 to 45 minutes. Follow Marie here to see her stunning photography mmforsberg.com, on Instagram and Twitter. The Cottage Kitchen is published by Clarkson Potter in NY. You can purchase your copy here. Eat Happy is a collection of quick meal fixes that neither require a lot of fuss nor a lengthy list of ingredients. Taking you from breakfast through to dinner and with plenty of exciting options for smoothies, teas and store cupboard essentials that get you through the day. This book more than covers the basics. Each dish is packed full of flavour and shares delicious ingredient combinations that will have you keen to cook from this book time and time again. Melissa’s enthusiasm and passion for food culminates in this beautifully styled and shot cookery book which is vibrant and mouth-wateringly good. I’m from Kingston and spent my first 10 years in London in Camden, now I’m an eastender for life in East London! I’ve got glorious Epping Forest on my doorstep and me and my blue Staffy Nelly put the world to rights gallivanting around it. Everything is better after a brisk walk even a 10 minute one, I work a lot from home so really important to get out the house and get in amongst nature. So many of my friends and loved ones would whats app me about 7pm on their way home on the tube for quick and easy meals that they didn’t need to think much about, that they could get from the shop by the station and get on the table asap. I’ve learnt that the things that put people off home cooking are lack of time, hard to get ingredients and too much washing up, so I made a cookbook that banished all of those things and made cooking feel good food simple and fuss-free! I love to pack my meals with veg and flavour and have them be uplifting, energising and nourishing as well as delicious. I know some people steer away from so called healthy recipes because they think they’ll be bland, tricky to make and unsatisfying so I show them that mine are anything but! I am a sucker for the crispy duck pancakes in chickpea wraps with hoisin sauce (which my boyfriend gets me to make a huge jar of so he can spoon it onto everything) and the spiced halloumi & chickpeas with black quinoa tabbouleh (leftovers of this make the best packed lunch). Sweet wise it’s got to be the little chocolate pots, they take 5 mins and 5 ingredients (see below). Another favourite is my BLT salad – bacon, lettuce, tomato, egg and asparagus – I’d eat this for breakfast, packed lunch, take it for a picnic, it’s a great all rounder. Looking for a quick mid week, no fuss dinner, which recipe should we head to? All of them! Every single recipe is designed to be fuss-free, quick and easy so take your pick- I usually make a decision based on what needs using up in the fridge and cupboards. My chinese egg fried quinoa is perfect for this, chop any leftover veg up throw into the pan with garlic and leftover quinoa and while it gets crispy and hot through, mix up a spicy sesame oil to drizzle over the top, then because a fried egg is always a good idea, fry one up in the same pan, season with a bit of tamari and soy. You can’t go wrong with my buckwheat blinis topped with spiced feta (or anything you fancy) as a real show stopper canape. I’ve made them 3 times in the last week and they always get a “wow!”. The sesame salmon & miso veg tray bake is minimal effort with almost no washing up so you can get it in the oven and enjoy your guests. Your ultimate dessert and why? My little chocolate pots are absolutely my go-to dessert for having friends over. Make them in advance and keep them in the fridge until you’re ready to serve and they will not disappoint. I’ll change up the toppings each time – pomegranate seeds with fresh mint leaves, or summer berries, toasted salted pistachios / almond flakes or coconut flakes, or sometimes I blend in a dash of peppermint or orange extract or even rose & touch of cardamon – delish! Rochelle’s in Shoreditch, we book a big table outside in May for my boyfriends bday and my dog runs about in the walled garden. Had so many great meals at Quality Chop House And I’ve got got wonderful memories special occasions at River Cafe & Petersham Nurseries. I don’t use any! I let my meals be dictated and inspired from what’s in my fridge / freezer and cupboards. But I collect cookery books and read them for pure enjoyment. I’ve been so enjoying presenting the #LiveLifeBetter podcast for Penguin Books interviewing everyone from a professor of sleep to a flirtologist , a body positive campaign to a monk. One of my favourite things is cooking classes, i love it when someone leaves my class feeling full of confidence. 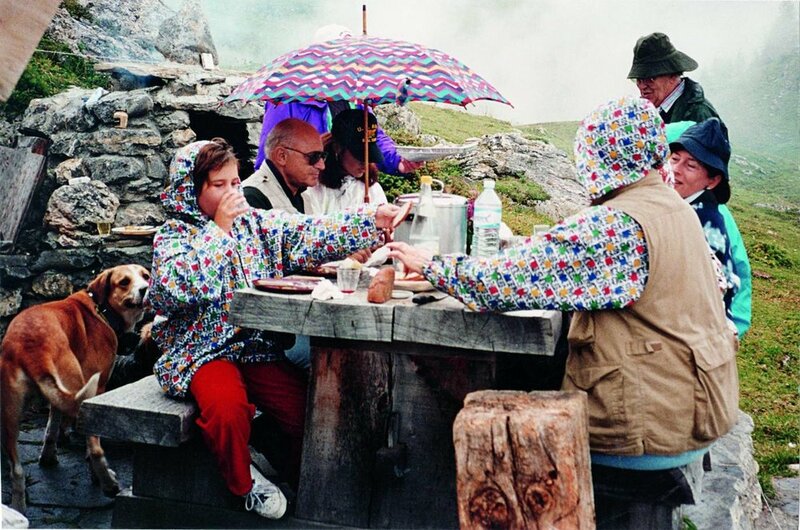 Food is Francesco Missoni's passion. Grandson to Tai and Rosita Missoni - founders of the acclaimed Missoni brand - and son to Angelina Missoni (the brand's Creative Director), Francesco and his family have spent many decades around the table, feeding each other and friends from around the world. In his inaugural cookbook, Francesco collates a number of inherited family recipes, and pays homage to them through this a vibrant and enticing collection. What can you expect to find within? Not just mouth-watering, traditional Italian dishes, but a number of personal photos from a very unique Missoni family album too. Home is between Milan and Sumirago. I have lived in Milan for over 10 years now, but I jump at any opportunity to go back Sumirago where I grew up and where all my family still live. It’s just 30 minutes by car from Milan but it feels like another planet. One day, when I have children, I will definitely move back there. My family. You should see the passion and the effort that everyone puts into the food when we organise a party or a family gathering. This is especially apparent when we are holidaying together in Sardinia, everybody is given very specific jobs. Anyone who loves good Italian cooking and wants that sense of family and soul in their food. What’s your ultimate dinner party dish? If you make a beautiful Bollito Misto (a classic northern Italian stew) with delicious vegetables and sides you can never go wrong. What’s your ultimate dessert and why? I would say either Tiramisu, I’m currently preparing an amazing one now with eggs from my grandma’s hen-house, or Key Lime Pie; I learnt how to make one when I was in New York and then last November I prepared one for over 60 people for my grandma Rosita’s birthday party. It was huge a success and now I’m receiving orders from all the family for their birthdays! Anthony Bourdain, Massimo Bottura, Nobu Matsuhisa and many more. I love to try new flavour combinations, it's exciting and inspiring. What are your top three favourite restaurants? That’s a difficult question. I don’t really have favourite restaurants as such, but I do have favourite dishes. I usually choose to go somewhere to eat a specific dish. At the moment Daphne’s in London has two dishes from my cookbook on their menu which is a great compliment. “Il Talismano Della Felicità”. It’s basically an encyclopaedia of Italian dishes. You can find a copy of this book in any of our kitchens. What’s your favourite recipe from the book and why? If I had to choose one I might say the Pollo Ubriaco (Coq au Vin). Why? Because it is probably the only dish from the book that I have never cooked by myself. It’s a labour of love, and one to cook with a friend. I was always asking for it with polenta for my birthday when I was little. For a quick mid-week, no fuss dinner. Which recipe should we head to? In Spring, like now, I would definitely go for Asparagi alla Milanese with eggs or some delicious Riso e Prezzemolo soup. If the asparagus stalks are thick, peel them lightly with a peeler to halfway down their length. Bring a large lidded pot fitted with a steamer insert containing about 1 inch of water over medium-high heat to a boil. Add the asparagus and steam for 8–10 minutes, depending on their thickness, or until the stalks cook through but remain al dente. Remove from the heat. Drain and individually plate the asparagus, counting 5 stalks per person. Generously cover the lower half of the asparagus with the Parmigiano Reggiano. In a small pan over medium heat, melt 5 tablespoons of the butter until very hot. Pour it over the Parmigiano-Reggiano and asparagus, melting the cheese. In a pan over medium-high heat, melt the remaining butter. As soon as the butter starts bubbling, add the eggs in batches, taking care not to crowd them, and fry them. Repeat until all of the eggs have been fried. Remove from the heat. Place the cooked eggs on top of the asparagus, season with sea salt and black pepper, and serve hot. All images are courtesy of the Missoni Family Cook Book which is out now, £38 published by Assouline. Daphne’s restaurant in London will have the Baked Rigatoni alla Sorrentina and the One and Only Budino chocolate dessert on their menu exclusively for the months of May, June and July. All images are courtesy of the Missoni Family Cook Book which is out now, £38 published by Assouline. Cook Beautiful is Athena Calderone's artfully curated seasonal cookery book. Creator of the hugely successful website ‘Eyeswoon' that covers everything worthy of a swoon, from interior inspiration through to homewares, travel, recipes, fashion and much much more. Athena Calderone is a seasoned pro when it comes to throwing the perfect get together with an aesthetic that's bound to seduce you like it did me. Cook Beautiful is a feast for the eyes in every sense and what’s more there are plenty of tips to help you with things like choosing your china and laying the table. Through Athena’s know how and creativity, each dish is turned into a mouthwatering masterpiece no matter how simple. 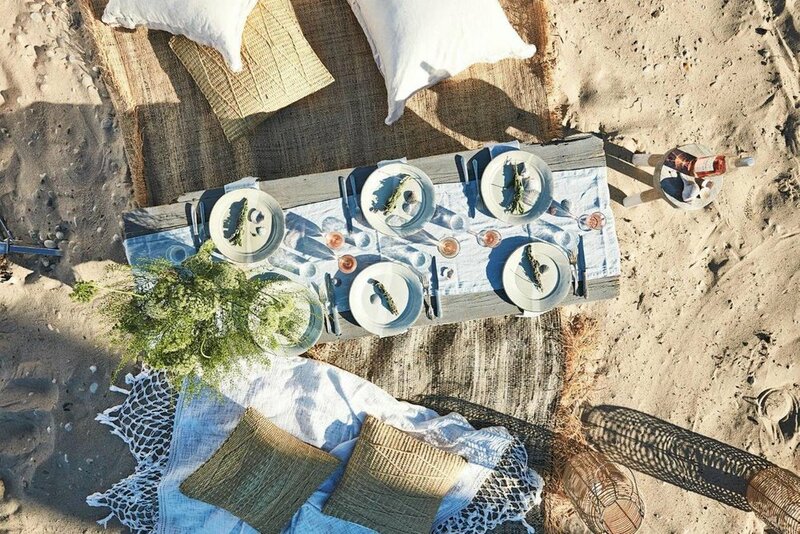 The book covers every season: there’s balmy summer evening spreads alongside the most beautiful beach picnics which will make you immediately want to head somewhere hot. 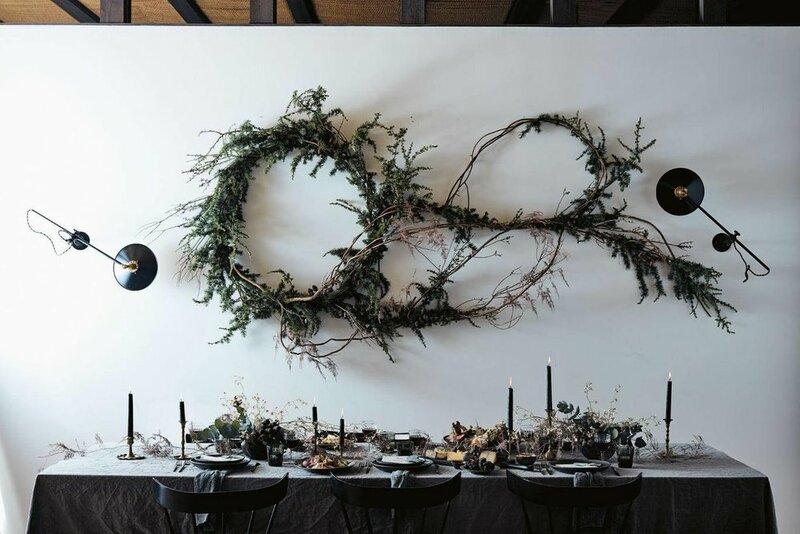 There’s autumnal table settings and richly decorated outdoor gatherings. Athena’s book will not only guide you through the next time you host but will also ensure you Cook Beautiful every step of the way. I live in Brooklyn, New York in the most charming tree-lined street, in a historic townhouse in Cobble Hill. Cook Beautiful encompasses all of my various lifestyle pursuits – food, design, art, music, seasonality, and entertaining. I love to create beauty, whether that is by building flavour and layering textures as I manipulate high quality seasonal ingredients, sharing an elegantly-presented plate of food, or designing a stunning tablescape or environment. I yearned for a place I could share my overlapping passions with a level of permanence – something that would live on forever as well as capture this very magical moment in time. I have learned so much over the years as I honed my skills and gained insight from the incredible food community – tips on elevating the presentation of our food, or the importance of eating locally and seasonally. I wanted to pass along all that I have experienced, to spread inspiration. A cookbook allowed me to share my love of cooking and capturing beauty. These pursuits, both in the kitchen and in the creative direction through styling, composition, and storytelling, are all forms of artistic expression for me. What's your recipe from the book and why? I really love the stewed pork with autumn-abundant squash and a vibrant and textural gremolata of walnuts, parsley, and pomegranates. This delicious dish is a perfect example of a meal that is elevated both in taste and in presentation by a beautiful finishing sauce. If we're looking for a quick mid-week, no-fuss dinner which recipe should we head to? A whole roasted chicken is the perfect no-fuss, one-pot meal. Place the chicken in a large roasting pan | Using your fingers, gently separate the skin from the flesh across the breasts and drumsticks | Rub the butter between the skin and the flesh. Rub the salt and 2 teaspoons of the sumac all over the chicken | If time permits, refrigerate the chicken, uncovered, for at least 6 hours and up to overnight. Preheat the oven to 425ºF (220˚C) | Squeeze half of one lemon over the chicken and place it inside the cavity along with a half head of garlic | Scatter the carrots, potatoes, onions, and remaining lemons and garlic around the chicken | Drizzle the vegetables and chicken with the ½ cup (120 ml) oil | Sprinkle the vegetables with the remaining 1 teaspoon sumac and season with salt and pepper, tossing until the vegetables are evenly coated | Roast, tossing the vegetables occasionally, until the chicken and vegetables are deep golden and cooked through and the chicken registers 165°F (72˚C) in the thickest part of the thigh, about 1 hour and 15 minutes. Allow the chicken to rest for 10 minutes before carving. Drizzle the labneh with oil and sprinkle it with the sesame seeds, some pepper, sumac, and flaky sea salt. Serve it alongside the chicken. SWOON TIP: Roasting a gorgeously golden chicken isn’t difficult, but it does help to think ahead. Chilling the bird, uncovered, for at least six hours dries out its surface, allowing the skin to caramelize and crisp up beautifully in the oven. 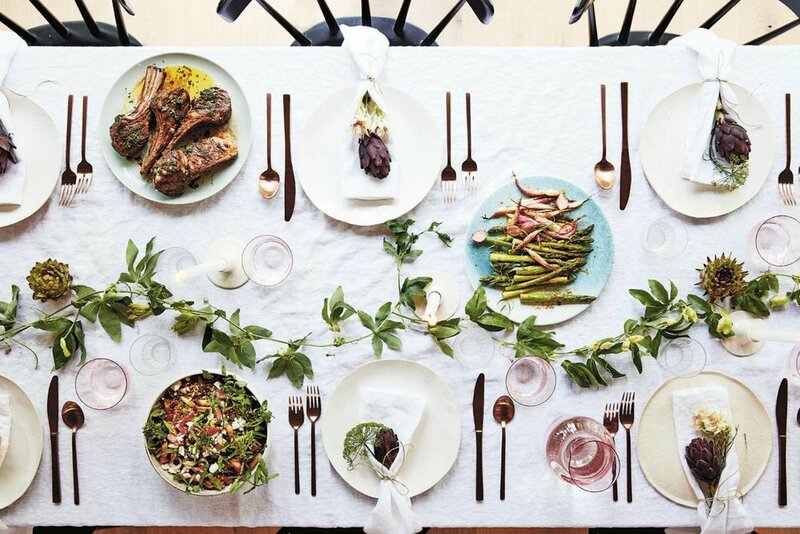 What's your ultimate dinner party dinner dish - failsafe and impressive? I love the whole roasted and citrus and herbed stuffed fish encased in salt for winter. It is impressive-looking but can be prepared in advance and later popped into the oven on a sheet pan. I am a big advocate of zippy and vibrant herb finishing sauces and the salsa verde is one I make on repeat for fish, chicken, steak, you name it. What's your to die for dessert, and why? Well, the butterscotch pot de crème with salted tahini caramel sauce is sinfully delicious. But my go-to is likely the hazelnut pear tart – it continually blows people away with the honey crème fraiche base and simple, press-in French crust. I have been making it for well over 15 years now. Missy Robbins, Dan Kluger, Ignacio Mattos. I love Ottolenghi and I also love the Gjelina cookbook. Who should people buy your book? Anyone who loves to cook seasonally and also appreciates visual presentation. First and foremost, I strive to create a delicious plate of food that shocks the palate with bold flavour. But I’m not gonna lie – I love to make things look beautiful, too. My approach is rooted in simplicity, and while aesthetics are paramount, so is accessibility. While developing recipes for Cook Beautiful, I wanted to unite my overlapping passions of food and design. With a background in interiors, visual presentation plays an integral role in everything I do – particularly how I style and plate food. I decided to pair each recipe with a tip that improves both the flavour and the overall beauty of a dish. This arsenal of easy tricks makes food both delicious and a feast for the eyes. After all, our eyes are what first lure us into a plate of food. I believe flavour and beauty, taste and visuals are always working in tandem with technique. Below, I've gathered some examples. I have a second book to write — this one will be design and décor focused. And have a fun TV show concept in the works combining both food and entertaining. Magnus Nilsson; the world-renowned and internationally acclaimed chef who currently holds two Michelin stars at his restaurant Fäviken in Sweden talks about his latest literary offering. An almost encyclopaedic account of Nordic baking, Nilsson shares over 450 recipes, all perfect for home cooks and keen bakers. This enormous body of work took over three years to collate and concludes his exploration of Nordic cuisine. A must have for any avid cook. The book is on nordic bakery. Where’s home for you? Home is halfway up Sweden, Järpen. (where Nillson’s two Michelin starred restaurant Fäviken is situated). You’ve been quoted as saying ‘I’m more of cook than a Baker’ What led you to focus on creating such an in depth book on baking? The whole project started 6 years ago, where the idea was to chronicle and document the whole of the Nordic food culture and baking is a huge part of that. So it seemed impossible to do that without having a book on baking. This six year project has been split into two publications, The Nordic Cook Book and The Nordic baking Book. The difference between this one and the Nordic Cook Book is that I collected and researched all the recipes but had Petrus Jakobsson (of the great Petrus bakery in Stockholm) bake and sample the recipes that went into the book, which in turn I then photographed. He contributed on a technical level to ensure that all the recipes worked. I wanted to explain what Nordic baking culture looks like and why it’s the way it is. Your favourite recipe from the book? Soft Swedish flatbread – which are very much linked to my childhood or the classic cinnamon bun. You share recipes that are ingrained in Nordic culture, how easily do these translate to the modern cook? Sometimes we believe that we decide what food culture is and that we shape it but we don’t. The food culture is the result of what people decide to cook and not the other way round. All the recipes in this book are recipes that people bake today. There are a few historical ones to add context but the majority are ones being baked at home today. So its very approachable in that sense. You wrote, researched, styled and shot the book over six years, has this been a labour of love for you? Yes! Within those six years The Nordic Cook book was released which I again shot and was the first half of this project, which The Nordic Baking Book concludes. When you write documentary books like this if you’re not able to do the photography yourself, the way I have, it would be almost impossible to shoot. You couldn’t commission a photographer to spend that much time out in the field, trying to collect moments. For me I’m travelling anyway, doing all the interviews, the research and you can snap away and occasionally you get something that’s good enough to go into the book. I set out wanting to make a documentary book explaining Nordic food culture and you realise you have to get it all in there to really get it right, as much as you can. While this is in part a tribute to the Nordic food culture the Nordic cuisine is one of the most misunderstood food cultures in the world so it felt important to do this and to explain what it really is. It’s more than gravlax, meatballs and herring. This isn’t indicative of how people really eat or bake. Which chefs have inspired you along the way? There have been so many. But for this project there are no chefs, as it’s not about professional cooking. In the more general sense it’s everyone I’ve worked for and all those that work for me now and in the past at Fäviken. They’re very inspiring people. It’s hard to pick one out but they all feed into your toolbox as a chef in a sense. Every time I’m over in London I always go to Umut 2000, a Turkish grill in Dalston plus try and get round some of the newly opened restaurants. Bakeri Petrus is also a must if in Stockholm. A series of cookery books that were very, very inspirational especially for this project were the Time-Life Foods of the world series produced in the 60’s. Incredibly thoroughly researched. They focused on specific regions of the world and are still relevant today, beautiful, original research, very impressive and very inspiring with quality photography. A series of books that they wrote for almost all of the parts of the world. It was inspirational to see that book and how much thorough and well researched work went into it and they’re smaller! I used to collect cookery books, I have over 3000, but they’re currently boxed up in the basement! When you write a book like this you also have to sell it afterwards, otherwise you don’t get to write more books like this. So there’s quite a bit of touring before I head back to work at Fäviken. I ‘m actually really looking forward to spending time at Fäviken. I also bought an apple orchard, 18 hectars so I’m working out what to do with that. Weekend Journals is a family team made up of my husband Simon, my brother Gabriel and myself. It was a departure from my digital life and work, and a way to showcase special weekend destinations through a physical book that we hoped people would want to own and keep. We started the venture two and a half years ago with the idea that each book would be about an area of the world that the three of us really care about: Cornwall (where Simon’s family are from) was first, followed by Provence (where Gabriel’s and my family are originally from) and now London, where we have all grown up and lived our whole lives. It’s quite rare to find a London guidebook produced completely by Londoners. And though we want it to be a useful - and beautiful - aid to first time visitors, I hope it will also inspire seasoned locals to explore different places in their home city. If you’ve never been to London where should you head to first? 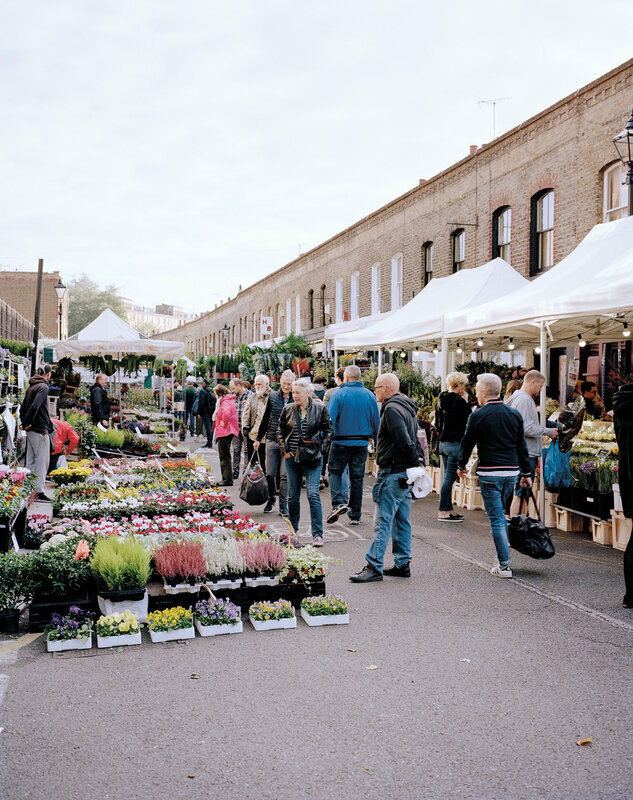 The markets are the heart and soul of London; Columbia Road, Portobello and Spitalfields all come alive at the weekend. London is so big with so much in every neighbourhood I recommend picking a few areas and really getting to know them well. Your top 3 favourite London restaurants featured and why? My list of favourite restaurants in London is forever changing. In this book I wanted to showcase eateries that are consistently serving delicious food, are atmospheric and aesthetically interesting, but most of all that I look forward to visiting days in advance. For local, seasonal fare and service with a (big) smile I head to Llewelyn’s in Herne Hill. It’s one of the only restaurants in my area that I return to time and time again. Hélène Darroze at the Connaught and Core by Clare Smyth are my “go-to”s for indulgent, special and delicious fine dining. Both are by strong female chefs (with two Michelin stars each) and I really admire the food they create and the kitchens they run. 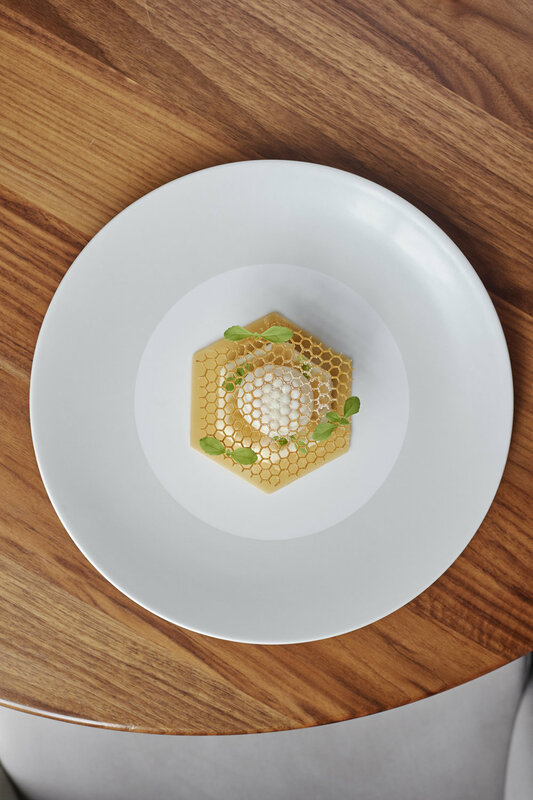 For creative cuisine I adore Roganic, it’s a Michelin star restaurant in Marylebone by Simon Rogan and has the most brilliant, reasonably-priced lunch menu, perfect for any midweek occasion. You’re a coffee addict, which three spots should you give a try? London has one of the best coffee scenes in the world, but some of the most recent additions to the scene can be a bit style-over-substance. The places I love concentrate on the quality of their coffee while caring about their customers and the design of their space. Story Coffee is perfect for a quiet afternoon caffeine kick, Coleman Coffee Roasters is a tiny chic cafe in Waterloo serving the most delicious coffee, and Ozone is great for morning meetings with a pour-over or for a hearty brunch with friends. Which shops are a must visit from the book? I’m a self-confessed stationery addict and have found my mecca at Choosing Keeping. It is the most magical emporium of speciality stationery from all over the world, handpicked and carefully curated by shop-owner Julia. For clothes, Margaret Howell is a wonderfully British staple, that champions British tailors and suppliers and makes clothes that make you feel and look good. For a real treat I pay Lyn Harris at Perfumer H a visit, her library of fragrances is a haven for scent lovers.